There’s nothing worse than walking into a kitchen and feeling like you don’t want to be there. I know, because it happened to me—my formerly cluttered, cramped kitchen made me want to run for the hills, and I am someone who loves cooking. All that disdain for my home’s culinary center went away when I decided to make a big change. I went minimal, and I never looked back. Here are some of my reasons why, as well as my best methods for simplifying and enjoying my kitchen from here on out. I must admit, I’m a sucker for infomercial-type gadgets that promise us perfect, simply cooked versions of our favorite foods. Sure, some of them really do work, but do we need dozens of appliances loading our kitchen shelves? The answer, of course, is no. It’s crucial to honestly decide what you actually need and what just sits and collects dust in your cabinets. I started by unloading all the pieces that no longer served me in my day-to-day. I’ve hung onto the must-haves, like my toaster and crockpot. The Belgian waffle maker and heart-shaped muffin tin have been donated. On top of that, excess cups, plates, silverware, serving platters—you name it—have all been thrown out, too. Now, I only keep table settings for four, a single type of glass for all occasions and a small selection of versatile serving plates. When they’re not in use, they’re used for food storage—my casserole holds all my potatoes, for instance. The whole point of minimalist design is that less is more. A simple, neutral color scheme soothes the eye, as does the lack of clutter on counters or other storage spaces. I chose to switch to the classic minimalistic color palette: a monochromatic white. My now-white cabinets soothe the eye and help my tiny kitchen visually flow much better into the rest of my living space. Plus, because I’ve gotten rid of so much stuff, this look is easy to maintain. My cabinets are well-organized, my counters are clear, and I have far fewer dishes to clean and put away. I spend a little time each week getting the white surfaces to gleam, but cleaning is now a relaxing activity rather than an overwhelming chore. Another stressor from my cramped-kitchen days was the fact that I was constantly throwing away food that had gone bad. It’s not like I left it there to rot—I just didn’t realize it was there. A simple pantry stocked with the necessities and a well-organized fridge with more fresh produce has helped me to stick to my weekly cooking plan. That way, I’m eating the majority of what I buy without creating unintentional, expensive waste. 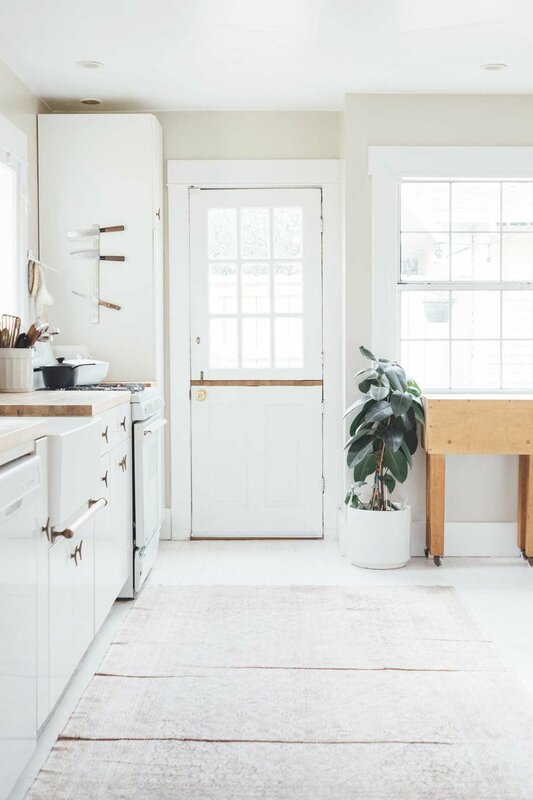 Ever since I ditched the excess in my kitchen and went with a crisp white color palette, I have felt so much better about being in the space. For one thing, it no longer stresses me out—overflowing cabinets full of clutter can cause serious anxiety. I even used a bit of my newly-open counter space to grow a little lavender so my home could smell as relaxing as it now looks. On top of that, I have shed a few pounds because I’m eating better and staying on top of my at-home cooking regimen. When I do go out to eat, I’m making healthier choices because I feel so good about what’s happening at home. It’s a great cycle to get into. Mostly, though, my minimalist kitchen is an outward representation of how much I respect food and its important role in my life. Now, I have the perfect space and the necessary tools to turn ingredients into something special. That’s what a minimalist kitchen can do for you, too. What is the current state of your kitchen? If you could simplify something in your kitchen, what would it be? Holly Welles is a home & garden writer passionate about helping readers make the most of their homes. You can read her latest tips on her blog, The Estate Update, and follow her on Twitter @HollyAWellesfor more real estate and home news.